Looking to Sell? Please tell me about the property you're looking to sell using the form below or by contacting me directly. Let's get started! How your home is marketed is the largest factor in deciding how quickly and for how much it’ll sell. In the above video (and on this webpage), I’m going to share with you how and why I market your home the way I do. First, know that I do everything a typical Realtor does. I’ll put a sign in the yard, coordinate an open house, and I’ll post the listing on the multiple listing service. But that’s just where I start. My first order of business is sending my creative team to your house to take professional photos, to get a floorplan drawn up, and to create a narrated video home tour. Photos are often the first exposure to your property so it’s critical that these images portray your home in its best possible light while creating an emotional reaction with potential buyers. A good floorplan is literally a map that details the size and layout of your home. Having your property precisely measured by a professional provides additional piece-of-mind to all parties: everyone knows that the square-footage being advertised is recent and accurate. Next is the video tour. Video is something that buyers expect to see and is an absolute must-have for every listing. The majority of my buyers come from out-of-market and my walkthrough tour allows them to experience your home wherever they are in the world. These videos also help to eliminate unnecessary and intrusive viewings – the only people visiting your home in person will be buyers that have qualified themselves by watching your video. This can be a real time saver if you work from home or have kids. It’s especially helpful for showing revenue properties. Instead of negotiating showing times with your tenant, potential buyers are screened using the video. Once photos, the floorplan, and the video are in place, I use them to advertise your listing on social media platforms like Facebook, Instagram, YouTube, and Real Estate Weekly. Using paid advertisements, I target the specific demographics and regions that are most likely to be interested in your home. My goal here is to get the most amount of exposure possible for your home in the shortest amount of time. More people seeing your home means more interest in your property and that translates to a quicker sale at top market value. As successful as this strategy has been, it’s only one piece of my marketing plan. While I’m promoting your listing, I’m also advertising for out-of-market buyers. Using video and audio marketing, I highlight the Sunshine Coast as an ideal location in which to live and invest. The audience that consumes this content is then directed to my listings. This type of marketing ensures that I have a steady pipeline of potential buyers that are falling in love with the idea of living on the Sunshine Coast. My strategy for attracting local buyers includes social media but I also invest heavily in traditional media on the Sunshine Coast. I have a sign at the high-traffic info centre at the bypass leaving the ferry and I can also be seen on bench and bus signs along local transit routes. My branding and name is on shopping carts at the local grocery store and I advertise regularly in the local newspaper and Sunshine Coast Real Estate Magazine. All of this is standard with each and every one of my listings. Depending on your specific property, I may suggest either virtually staging or virtually renovating your property. This is when the original photos are edited to show what your home could look like different with furniture or finishes. 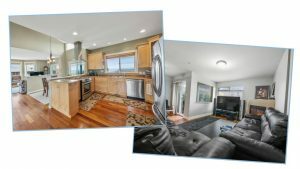 An interactive Matterport tour can also be of benefit for some properties. This complete marketing system is included at no extra cost when you list with me. I actively and aggressively advertise your property 24-hours-a-day to ensure it gets the maximum exposure required to sell quickly and for the top possible price. My clients often comment on my professionalism as a Realtor and my effectiveness as a marketer. If you don’t work with an agent that invests heavily in digital media both on and off the Sunshine Coast, you will be doing yourself a disservice. Call me when you’re ready to sell and my team and I will go to work for you. Please tell me about the property you’re looking to sell, using the form on the right or by contacting me directly. Let’s get started!